Eve is the best and the brightest of her graduating class at the School. She's confident that she'll have a promising future as an artist beyond the contained walls of School, where her real life will start. But her dreams are rudely disrupted the night before graduation, when she learns the truth about what happens to girls after graduation—nothing but a miserable future strapped to a bed and producing children to repopulate their post-apocalyptic world. Devastated and terrified, Eve flees School into the wilds of what used to be the western United States. There, she meets Caleb, the first male she's seen in over ten years. Despite being a bit rough around the edges and the lies that the teachers told her at School, Caleb becomes a friend and ally, and the two dare to imagine a better future, despite the viscous world that's bent on prying them apart. Eve's story is a compelling and terrifying one, and Anna Carey does an excellent job at constructing a creepy, cut-throat, and desolate setting out of the remains of the American society. This is a book full of tragedy, as Eve's dreams are shattered and she discovers a tough world full of victimized orphans just trying to survive, but also one of strength. 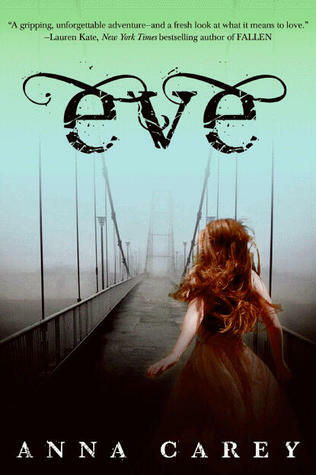 Eve, despite all of her book learning, is put to the test in every way imaginable when she flees into the wilderness and is forced to learn how to survive, how to interact with males for the first time, and realizes the importance of having an education, even in the most unlikely of circumstances. She's a capable character who goes through a lot, but adapts quickly, while still making some inevitable mistakes that readers can empathize with. The importance and complexity of relationships is shown in her tenuous connection to Arden, a caustic fellow classmate at the School who has some secrets of her own, and in Eve and Caleb's cautious friendship that slowly morphs into the expected romance. Eve is an absorbing novel about self-discovery and growing up with some smart and effective pop culture references and high-stakes action sequences that will keep you on the edge of your seat and steal your breath away. Cover Comments: I like the cover and interesting mix of colors. It's different, but appealing. The bridge does hold some significance in the story, so I like that it's included, and that what lies on the other side is shrouded in the mist. I guess the only thing I really object to is the odd position of the model's left arm...it just looks really awkward to me. This one will be available on October 4th, 2011, but don't worry--you'll definitely be hearing more about this one between now and then. ARC picked up at the HarperCollins event during BEA week. This sounds so interesting! I'm dying to read it. I've heard really mixed reviews on this one-- but you make it sound intriguing. There are so many good dystopians, and I hope this is one of them! Eeks This cover caught my eye immediately! That girl's red hair is stunning, not to mention the summary, which is gorgeous. This is a great idea! I've never seen this book around before. I will be sure to try and get it. It sounds like an amazing novel.